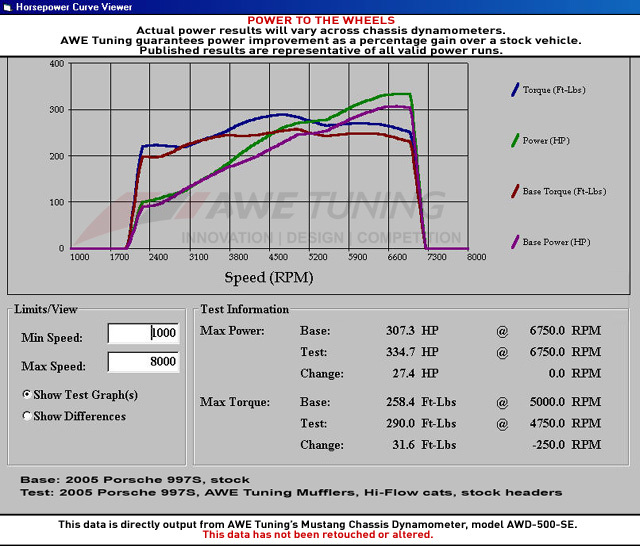 AWE Tuning has produced an exhaust that is sophisticated, refined, and powerful, all at once. The performance gains will ensure that you will stay ahead of the competition. 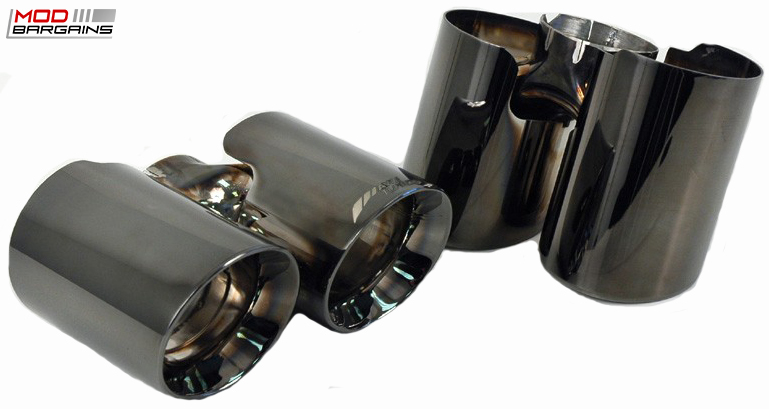 Diamond Black tips will give your rear end a much more stealthier and sleek appearance. AWE Tuning's tips are cut at an angle with their logo beveled on the edge, and are 100% 304 stainless steel featuring double wall construction for resistance to heat discoloration. They are available in a polished silver or diamond black finish. Diamond black is deep and lustrous for a sophisticated stealth look. Please Note: The stock 997 OEM tips are too small, so it is recommended for the 997 to use the AWE Tuning stainless steel tips to reach advertised power as well as to ensure proper fitment. 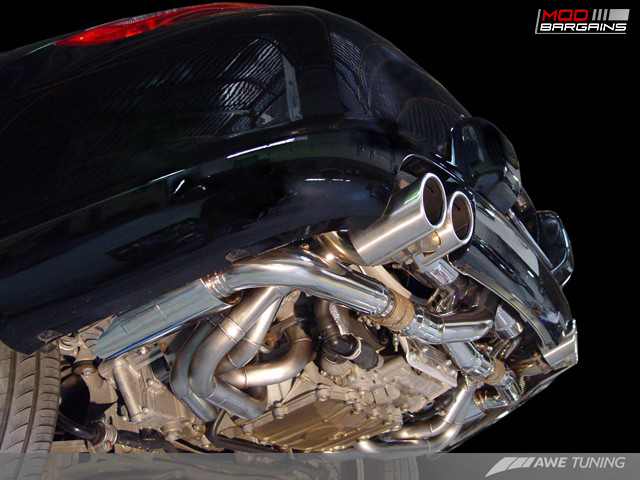 Throughout the entire Porsche 997 Carrera / Targa / S Performance Exhaust’s R&D process, AWE Tuning has taken extra steps to produce a no compromise exhaust muffler. Along with this incredible bump in power came a voice to die for. At full throttle with your eyes closed, you'll swear that you're hearing the sound of a GT class ALMS Porsche barreling down the start/finish line from Daytona International Raceway. 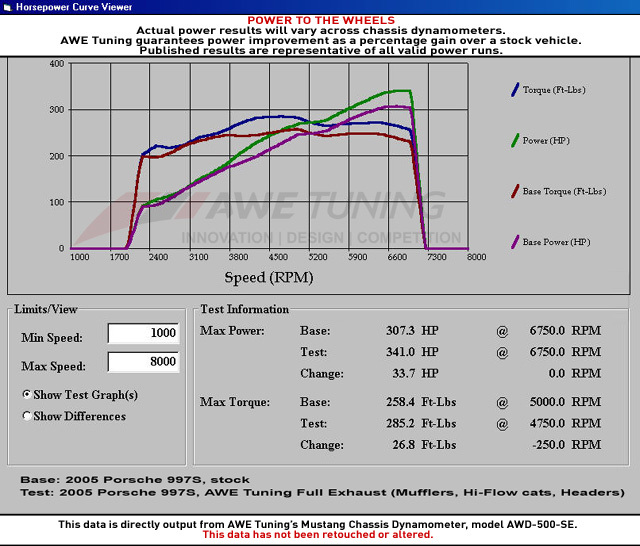 AWE Tuning's exhausts have earned praise from owners and the press alike, due to their unique "Jekyll and Hyde" personality. AWE Tuning spends a considerable amount of time and effort during development to achieve remarkable civility when idling and at part throttle cruising, while also producing a war-cry wail when full throttle is applied. 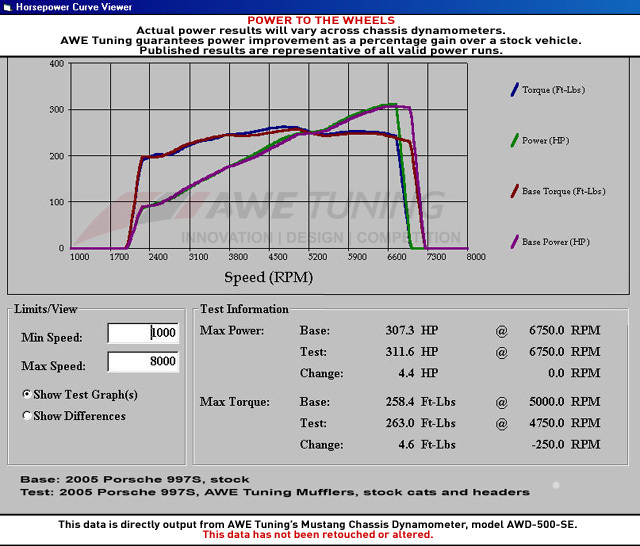 The results of AWE Tuning's 997S exhaust development program surpassed even AWE Tuning's expectations. Uncorking 3.8l of displacement through the use of less restrictive mufflers, high flow German HJS 200 cell cat sections, and tubular merge collector headers netted us a major power improvement across almost the entire powerband. 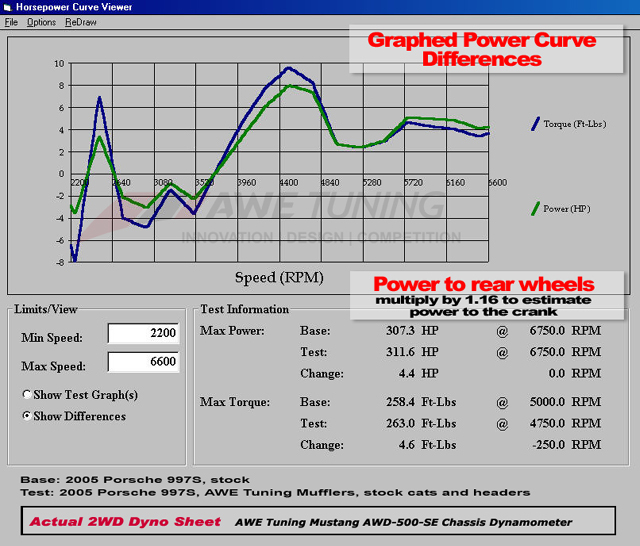 Depending on vehicle AWE Tuning has seen a range of +28 to 39 crank horsepower and +28 to 31 crank torque improvement. This system is also modular, meaning that any one of the three components can be installed along with the stock components. 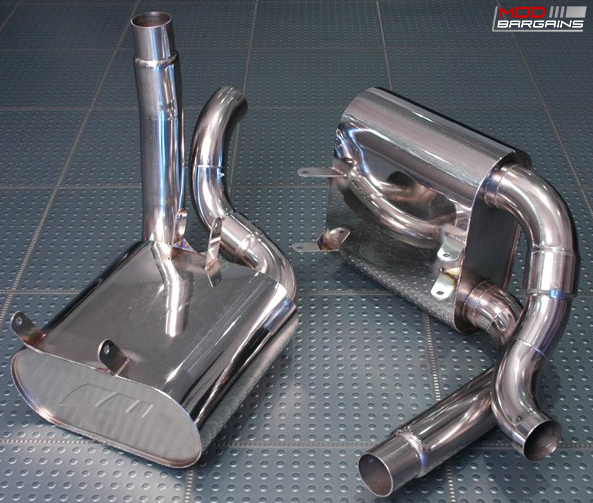 For example, if a sweeter sound is your primary desire, you can install just AWE Tuning's mufflers. Or if you're looking for maximum performance you can replace your mufflers, cat sections, and headers with AWE Tuning's performance versions. 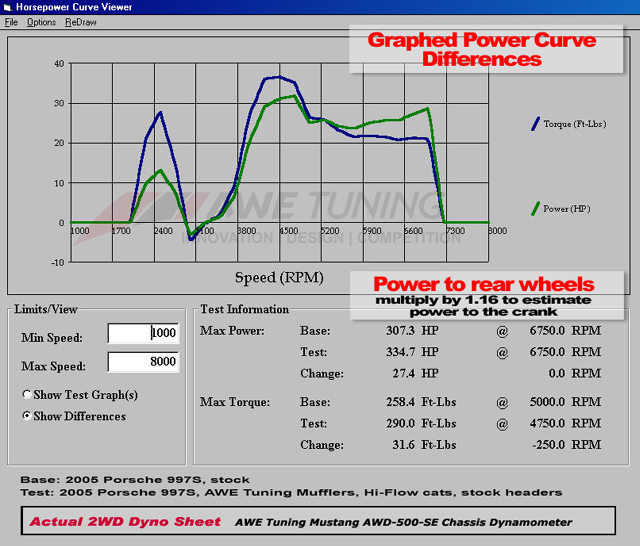 See the dyno sheets below for the gains found with each stage of tune. 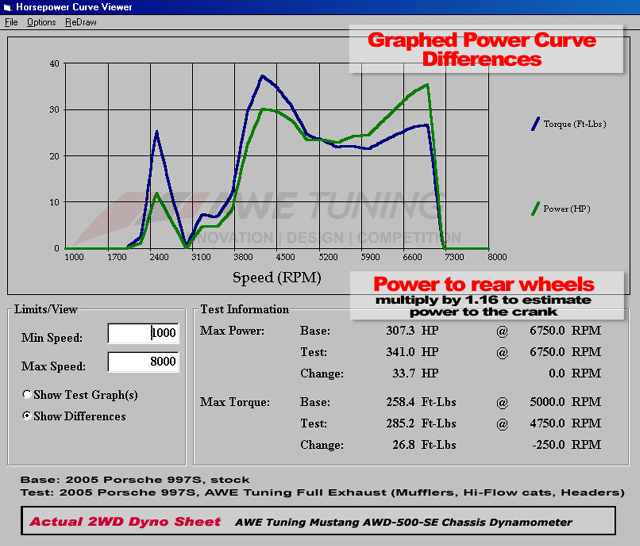 If a particular combination is not shown, do not hesitate to contact AWE, as they will most likely have the dyno sheet in their archives.